The Phoenix Suns have agreed to a five-year, $158 maximum contract extension with guard Devin Booker. The Suns drafted Booker with the 13th pick in the 2015 NBA Draft. The Phoenix Suns have secured a cornerstone of their franchise for years to come. 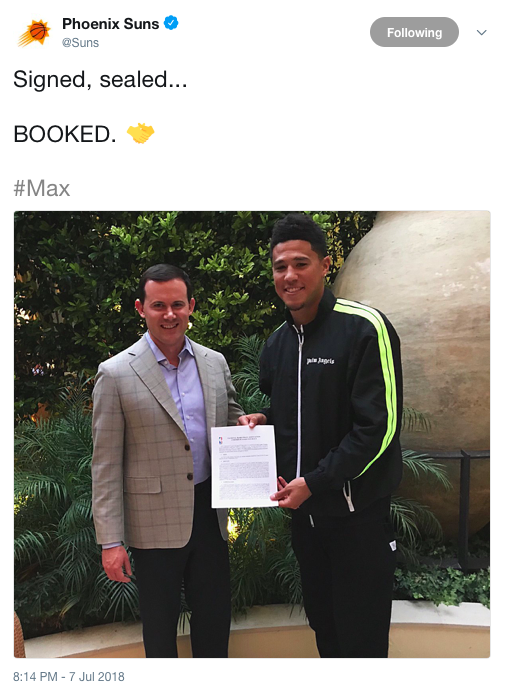 On Saturday, the organization agreed to a five-year, $158 million maximum contract extension with guard Devin Booker. "Phoenix Suns fans, it's official. The day I've been waiting on. To sign another five years with a great organization. The future is here, it's looking good. I'm excited." Booker said in a video to Suns fans. 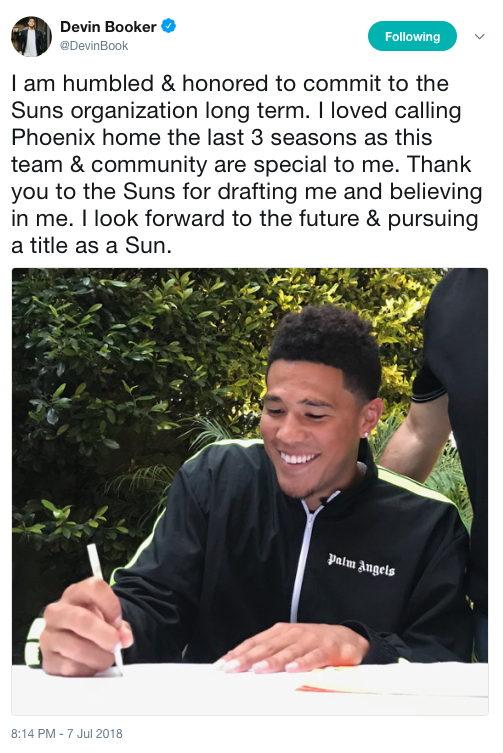 The Suns drafted Booker with the 13th pick in the 2015 NBA Draft. Since then, he has become a fan favorite and rising star in the NBA. The 21-year-old Booker averaged 24.9 points, 4.5 rebounds and 4.7 assists per game last season, making him one of nine players in the league and the youngest to average at least 24 points, four rebounds and four assists a night. Looking to cement himself as one of the league’s best young players in year two, Booker put the entire league on notice on March 24, 2017, scoring 70 points in Boston. He set a franchise record for most points in a game while smashing his old career-high of 39, a total he reached after three quarters. 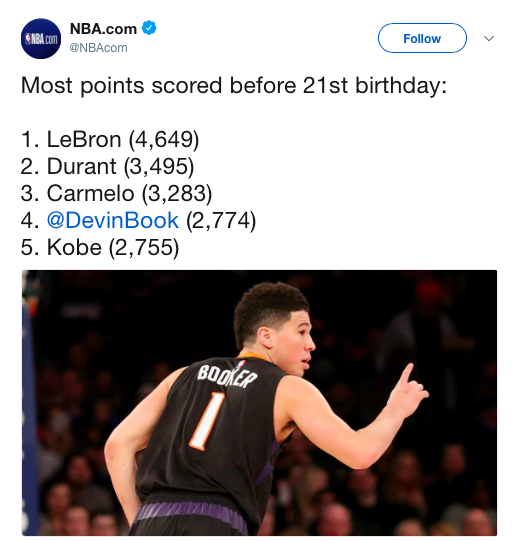 Booker possesses the 11th 70-point performance in league history and is currently the only active player in the NBA to reach the achievement. Since joining the Suns, has earned 2015-2016 All-Rookie team and is a three-point champion. His 2,774 career points are fourth-most for a player before the age of 21, trailing only LeBron James, Kevin Durant and Carmelo Anthony. 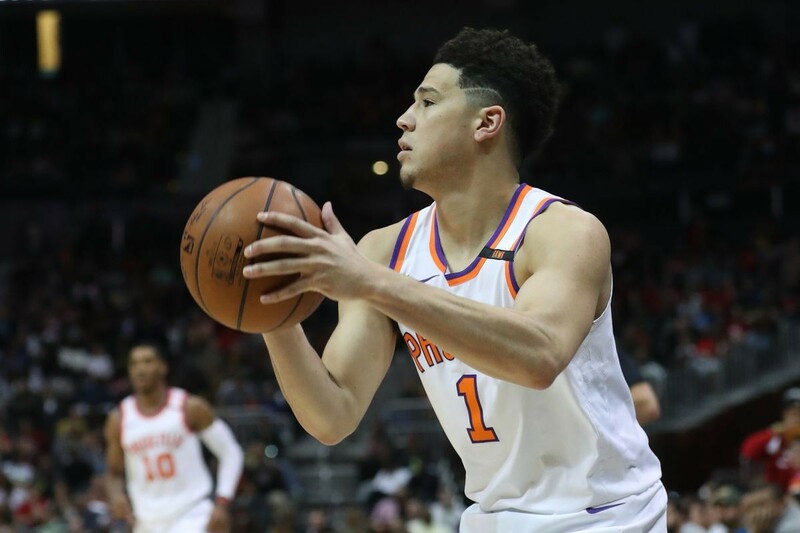 With rookies Deandre Ayton and Mikal Bridges, along with Josh Jackson, T.J. Warren, Marquese Chriss and Dragan Bender, surrounding him, Booker can continue to grow and hopefully add to his already accomplished, impressive resume.